Home Jesus The True Easter Story Who Was Judas Iscariot, Why Did he Betray Jesus, And What Happened To Him? Who Was Judas Iscariot, Why Did he Betray Jesus, And What Happened To Him? 139:12.1 Judas Iscariot, the twelfth apostle, was chosen by Nathaniel. He was born in Kerioth, a small town in southern Judea. When he was a lad, his parents moved to Jericho, where he lived and had been employed in his father's various business enterprises until he became interested in the preaching and work of John the Baptist. Judas's parents were Sadducees, and when their son joined John's disciples, they disowned him. 139:12.2 When Nathaniel met Judas at Tarichea, he was seeking employment with a fish-drying enterprise at the lower end of the Sea of Galilee. He was thirty years of age and unmarried when he joined the apostles. He was probably the best-educated man among the twelve and the only Judean in the Master's apostolic family. Judas had no outstanding trait of personal strength, though he had many outwardly appearing traits of culture and habits of training. He was a good thinker but not always a truly honest thinker. Judas did not really understand himself; he was not really sincere in dealing with himself. 139:12.4 There was no special trait about Jesus which Judas admired above the generally attractive and exquisitely charming personality of the Master. Judas was never able to rise above his Judean prejudices against his Galilean associates; he would even criticize in his mind many things about Jesus. Him whom eleven of the apostles looked upon as the perfect man, as the "one altogether lovely and the chiefest among ten thousand," this self-satisfied Judean often dared to criticize in his own heart. He really entertained the notion that Jesus was timid and somewhat afraid to assert his own power and authority. 139:12.5 Judas was a good business man. It required tact, ability, and patience, as well as painstaking devotion, to manage the financial affairs of such an idealist as Jesus, to say nothing of wrestling with the helter-skelter business methods of some of his apostles. Judas really was a great executive, a farseeing and able financier. And he was a stickler for organization. None of the twelve ever criticized Judas. As far as they could see, Judas Iscariot was a matchless treasurer, a learned man, a loyal (though sometimes critical) apostle, and in every sense of the word a great success. The apostles loved Judas; he was really one of them. He must have believed in Jesus, but we doubt whether he really loved the Master with a whole heart. The case of Judas illustrates the truthfulness of that saying: "There is a way that seems right to a man, but the end thereof is death." It is altogether possible to fall victim to the peaceful deception of pleasant adjustment to the paths of sin and death. Be assured that Judas was always financially loyal to his Master and his fellow apostles. Money could never have been the motive for his betrayal of the Master. 139:12.7 To Jesus, Judas was a faith adventure. From the beginning the Master fully understood the weakness of this apostle and well knew the dangers of admitting him to fellowship. But it is the nature of the Sons of God to give every created being a full and equal chance for salvation and survival. 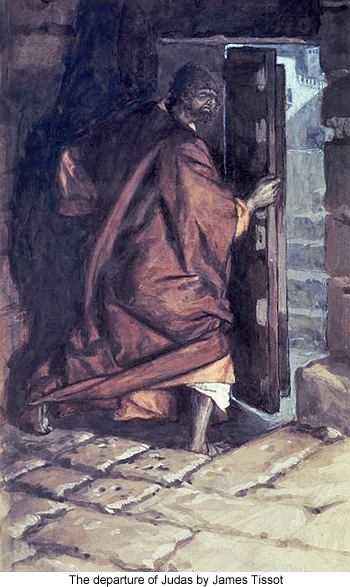 Jesus wanted not only the mortals of this world but the onlookers of innumerable other worlds to know that, when doubts exist as to the sincerity and wholeheartedness of a creature's devotion to the kingdom, it is the invariable practice of the Judges of men fully to receive the doubtful candidate. The door of eternal life is wide open to all; "whosoever will may come"; there are no restrictions or qualifications save the faith of the one who comes. 139:12.8 This is just the reason why Jesus permitted Judas to go on to the very end, always doing everything possible to transform and save this weak and confused apostle. But when light is not honestly received and lived up to, it tends to become darkness within the soul. Judas grew intellectually regarding Jesus' teachings about the kingdom, but he did not make progress in the acquirement of spiritual character as did the other apostles. He failed to make satisfactory personal progress in spiritual experience. 139:12.1 But these wicked and dangerous ideas did not take definite shape until the day when a grateful woman broke an expensive box of incense at Jesus' feet. This seemed wasteful to Judas, and when his public protest was so sweepingly disallowed by Jesus right there in the hearing of all, it was too much. That event determined the mobilization of all the accumulated hate, hurt, malice, prejudice, jealousy, and revenge of a lifetime, and he made up his mind to get even with he knew not whom; but he crystallized all the evil of his nature upon the one innocent person in all the sordid drama of his unfortunate life just because Jesus happened to be the chief actor in the episode which marked his passing from the progressive kingdom of light into that self-chosen domain of darkness. 139:12.1 The Master many times, both privately and publicly, had warned Judas that he was slipping, but divine warnings are usually useless in dealing with embittered human nature. Jesus did everything possible, consistent with man's moral freedom, to prevent Judas's choosing to go the wrong way. The great test finally came. The son of resentment failed; he yielded to the sour and sordid dictates of a proud and vengeful mind of exaggerated self-importance and swiftly plunged on down into confusion, despair, and depravity. 139:12.1 Judas then entered into the base and shameful intrigue to betray his Lord and Master and quickly carried the nefarious scheme into effect. During the outworking of his anger-conceived plans of traitorous betrayal, he experienced moments of regret and shame, and in these lucid intervals he faint-heartedly conceived, as a defense in his own mind, the idea that Jesus might possibly exert his power and deliver himself at the last moment. 139:12.1 When the sordid and sinful business was all over, this renegade mortal, who thought lightly of selling his friend for thirty pieces of silver to satisfy his long-nursed craving for revenge, rushed out and committed the final act in the drama of fleeing from the realities of mortal existence— suicide. 139:12.1 The eleven apostles were horrified, stunned. Jesus regarded the betrayer only with pity. The worlds have found it difficult to forgive Judas, and his name has become eschewed throughout a far-flung universe. 177:4.1 Shortly after Jesus and John Mark left the camp, Judas Iscariot disappeared from among his brethren, not returning until late in the afternoon. This confused and discontented apostle, notwithstanding his Master's specific request to refrain from entering Jerusalem, went in haste to keep his appointment with Jesus' enemies at the home of Caiaphas the high priest. This was an informal meeting of the Sanhedrin and had been appointed for shortly after ten o'clock that morning. This meeting was called to discuss the nature of the charges which should be lodged against Jesus and to decide upon the procedure to be employed in bringing him before the Roman authorities for the purpose of securing the necessary civil confirmation of the death sentence which they had already passed upon him. 177:4.10 But it was ever just that way. Judas had long been engaged in this deliberate, persistent, selfish, and vengeful consciousness of progressively building up in his mind, and entertaining in his heart, these hateful and evil desires of revenge and disloyalty. Jesus loved and trusted Judas even as he loved and trusted the other apostles, but Judas failed to develop loyal trust and to experience wholehearted love in return. And how dangerous ambition can become when it is once wholly wedded to self-seeking and supremely motivated by sullen and long-suppressed vengeance! What a crushing thing is disappointment in the lives of those foolish persons whom, in fastening their gaze on the shadowy and evanescent allurements of time, become blinded to the higher and more real achievements of the everlasting attainments of the eternal worlds of divine values and true spiritual realities. Judas craved worldly honor in his mind and grew to love this desire with his whole heart; the other apostles likewise craved this same worldly honor in their minds, but with their hearts they loved Jesus and were doing their best to learn to love the truths which he taught them. 179:4.2 When the twelve heard this, having already been robbed of much of their self-assertiveness and self- confidence by the parable of the feet washing and the Master's subsequent discourse, they began to look at one another while in disconcerted tones they hesitatingly inquired, "Is it I?" And when they had all so inquired, Jesus said: "While it is necessary that I go to the Father, it was not required that one of you should become a traitor to fulfill the Father's will. This is the coming to fruit of the concealed evil in the heart of one who failed to love the truth with his whole soul. How deceitful is the intellectual pride that precedes the spiritual downfall! My friend of many years, who even now eats my bread, will be willing to betray me, even as he now dips his hand with me in the dish." 186:1.1 It was about half past eight o'clock this Friday morning when the hearing of Jesus before Pilate was ended and the Master was placed in the custody of the Roman soldiers who were to crucify him. As soon as the Romans took possession of Jesus, the captain of the Jewish guards marched with his men back to their temple headquarters. The chief priest and his Sanhedrist associates followed close behind the guards, going directly to their usual meeting place in the hall of hewn stone in the temple. Here they found many other members of the Sanhedrin waiting to learn what had been done with Jesus. As Caiaphas was engaged in making his report to the Sanhedrin regarding the trial and condemnation of Jesus, Judas appeared before them to claim his reward for the part he had played in his Master's arrest and sentence of death. 186:1.2 All of these Jews loathed Judas; they looked upon the betrayer with only feelings of utter contempt. Throughout the trial of Jesus before Caiaphas and during his appearance before Pilate, Judas was pricked in his conscience about his traitorous conduct. And he was also beginning to become somewhat disillusioned regarding the reward he was to receive as payment for his services as Jesus' betrayer. He did not like the coolness and aloofness of the Jewish authorities; nevertheless, he expected to be liberally rewarded for his cowardly conduct. He anticipated being called before the full meeting of the Sanhedrin and there hearing himself eulogized while they conferred upon him suitable honors in token of the great service which he flattered himself he had rendered his nation. Imagine, therefore, the great surprise of this egotistic traitor when a servant of the high priest, tapping him on the shoulder, called him just outside the hall and said: "Judas, I have been appointed to pay you for the betrayal of Jesus. Here is your reward." And thus speaking, the servant of Caiaphas handed Judas a bag containing thirty pieces of silver—the current price of a good, healthy slave. 186:1.4 From a distance Judas saw them raise the cross piece with Jesus nailed thereon, and upon sight of this he rushed back to the temple and, forcing his way past the doorkeeper, found himself standing in the presence of the Sanhedrin, which was still in session. The betrayer was well-nigh breathless and highly distraught, but he managed to stammer out these words: "I have sinned in that I have betrayed innocent blood. You have insulted me. You have offered me as a reward for my service, money—the price of a slave. I repent that I have done this; here is your money. I want to escape the guilt of this deed." 186:1.5 When the rulers of the Jews heard Judas, they scoffed at him. One of them sitting near where Judas stood, motioned that he should leave the hall and said: "Your Master has already been put to death by the Romans, and as for your guilt, what is that to us? See you to that—and begone!" 186:1.7 This onetime ambassador of the kingdom of heaven on earth now walked through the streets of Jerusalem, forsaken and alone. His despair was desperate and well-nigh absolute. On he journeyed through the city and outside the walls, on down into the terrible solitude of the valley of Hinnom, where he climbed up the steep rocks and, taking the girdle of his cloak, fastened one end to a small tree, tied the other about his neck, and cast himself over the precipice. Ere he was dead, the knot which his nervous hands had tied gave way, and the betrayer's body was dashed to pieces as it fell on the jagged rocks below.